Samantha Davidson has a secret: she can hear other people’s thoughts. Not everyone’s and not all the time, but it’s enough to convince her she can’t really trust anyone. Now, transplanted to a strange country, estranged from her family and peers, she begins to hear the voices of those no longer living or earthbound. Will she heed them as they lead her to a dark, forgotten corner of her past? Or will she surrender to the love and light offered by newfound friends, and learn to listen to the one voice she has long suppressed—her own? 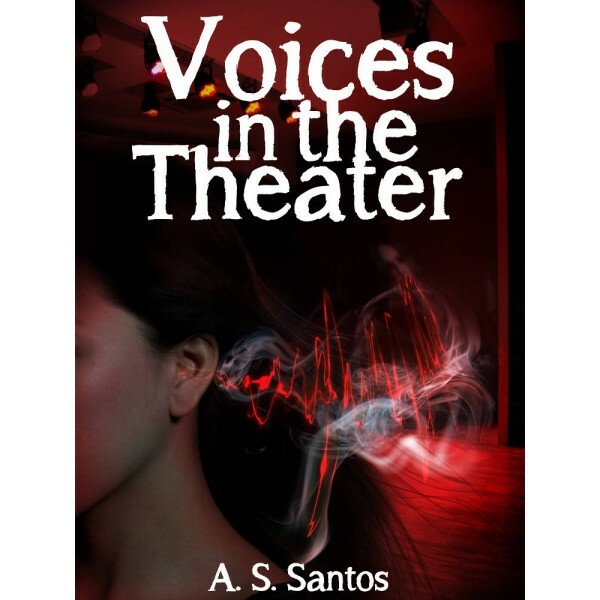 Voices in the Theater is the first installment of A.S. Santos’ three-book Young Adult Paranormal Romance. Follow Sam and her friends in the Student Paranormal Research Group as they encounter bizarre and often dangerous supernatural occurrences, battle demons both spiritual and psychological, and navigate adolescence and young love. Have you had paranormal encounters? I might have, when I was a child up to when I was in high school. There was a time I woke up in the middle of the night almost paralyzed by fright.There seemed to be something hovering over my bed. There was the sound of rustling on the floor. I had the impression that there were little creatures by my bed and that they were celebrating. I was going with them. I invited them. I covered my head with the blanket, staring up at the cloth. I don’t know how it happened but I saw through the blanket. The thing up in the air, an old woman with floating hair placed its palm on my face. To make the long story short, I prayed, struggling not to lose consciousness, until the morning light entered my room and I gained the courage to jump from my bed to switch on the light. Well, I was experiencing teenage angst then. I was probably hallucinating due to too much stress and adolescent hormones. Or I was not. Whatever the case, these days the only paranormal I care about is in books. So I jumped on the chance to buy A.S. Santos’s Voices in the Theater, the first book in a trilogy of college age kids who formed a student paranormal research group. The aim of this group is to research so-called hauntings in campus and to help those who might be troubled by paranormal encounters. The story is told from the viewpoint of Samantha, an American-Filipino who not only had to deal with hearing voices but also with a different culture. She doesn’t believe in God but she hears ghosts. She would eventually hear and see other things. The group soon came to use her ability in its investigations. What the SPRG members didn’t realize immediately was that they were in the center of a vast spiritual warfare between good and evil. Each member had his or her strength but each also had weaknesses that evil forces could use to manipulate them towards depression and evil thoughts. Samantha herself was a weak link. She had a troubled relationship with her dad who blamed her for the death of her grandmother. In her mind were suppressed memories that could destroy her if they surfaced. I found the story very strong on atmosphere–chilling in some parts, especially near the start when they explored the university’s Little Theater and the recording devices picked up strange sounds and energy fluctuations. What Sam heard was scarier. The characters were promising more than interesting though as paranormal took center stage and characterization received less attention. I found Sam a somewhat faded character. She had issues but she did not seem to feel them too deeply. It was like the voices she heard drowned her out as a character. I also found her disbelief in God illogical given the context of what was happening with her, surrounded by proof of supernatural entities, who either were worshiping God or cursing Him. Didn’t her Filipino mother teach her a little about Faith? But in this aspect, I will grant that perhaps I am assuming that a Filipino character should automatically be religious or will believe in God. There is romance in this book. It scandalized me though. I felt the power in the moment of meeting but I found the paranormal romance element in a very supernatural horror story jarring. I wasn’t expecting it. Some readers may like it–but I felt embarrassed. She prays to the love interest, for Pete’s sake! I won’t say anything more about it for fear of spoilers. Overall, I found this story gripping even if it faltered badly in one or two areas. The beginning was very good, the middle ok, and the end unbelievably moronic. I was shocked to hell about one of the ‘reveals’ but I couldn’t accept how neat and pat the results were. Yes, there may be forgiveness for such an act but I don’t think it will come so quickly even if the heavenly host was egging you on. I also don’t think this act could leave the relationship intact. It just wasn’t realistic. It was a heinous crime and there were repercussions that the story ignored. Again, despite the flaws in the story, I found it gripping. There was an assurance to the voice of the author. When I read the author bio, I found out that she herself became immensely curious in the paranormal as a teenager. She could sense things. She started to tell the fortunes of others. But she learned to channel this gift into counseling. Today, she is a registered guidance counselor with a Masters degree in Counseling Psychology. When interviewed for a newspaper article, she shared that she wrote this trilogy because she wanted to help give young people answers about their paranormal experiences. According to her, spiritual warfare is quite real. If spirits are real, then God is even more real. On one hand I am creeped out by this. On the other hand, I am reassured. On the flyleaf of my copy, the author wrote: May this story strengthen you in faith, hope and love. On the heels of some emotional struggles, this note brings much positive vibes, especially in light of what the author also reassured readers in her bio, that there is one most important truth, and that is, we are loved. Sounds interesting! Although I do have a bit of an issue about the cover. But the way you described the plot makes me curious about this one! Thanks! The cover of the Kindle version looks better, I think. What I have is the print copy.